Decision No 1692/96/EC of the European Parliament and of the Council (3) was recast in the interest of clarity by Decision No 661/2010/EU of the European Parliament and of the Council (4). The planning, development and operation of trans-European transport networks contribute to the attainment of major Union objectives, as set out in, inter alia, the Europe 2020 Strategy and the Commission White Paper entitled "Roadmap to a Single European Transport Area – Towards a competitive and resource efficient transport system" ("the White Paper"), such as the smooth functioning of the internal market and the strengthening of economic, social and territorial cohesion. Their specific objectives also include allowing the seamless, safe and sustainable mobility of persons and goods, ensuring accessibility and connectivity for all regions of the Union, and contributing to further economic growth and competitiveness in a global perspective. Those specific objectives should be achieved by establishing interconnections and interoperability between national transport networks in a resource-efficient and sustainable way. For example, rail interoperability could be enhanced by innovative solutions aimed at improving compatibility between systems, such as on-board equipment and multi-gauge rail tracks. Growth in traffic has resulted in increased congestion in international transport. In order to ensure the international mobility of passengers and goods, the capacity of the trans-European transport network and the use of that capacity should be optimised and, where necessary, expanded by removing infrastructure bottlenecks and bridging missing infrastructure links within and between Member States and, as appropriate, neighbouring countries, and taking into account the ongoing negotiations with candidate and potential candidate countries. As stated in the White Paper, the efficiency and effectiveness of transport can be significantly enhanced by ensuring a better modal integration across the network, in terms of infrastructure, information flows and procedures. The White Paper calls for the deployment of transport-related information and communication technology to ensure improved and integrated traffic management and to simplify administrative procedures through improved freight logistics, cargo tracking and tracing, and optimised schedules and traffic flows. As such measures promote the efficient management and use of transport infrastructure, they should fall within the scope of this Regulation. The trans-European transport network policy has to take into account the evolution of transport policy and infrastructure ownership. Member States are still the principal entity in charge of creating and maintaining transport infrastructure. However, other entities, including private-sector partners, have also become relevant for the implementation of a multimodal trans-European transport network and the related investments, including regional and local authorities, infrastructure managers, concessionaires or port and airport authorities. The trans-European transport network consists to a large extent of existing infrastructure. In order fully to achieve the objectives of the new trans-European transport network policy, uniform requirements regarding the infrastructure should be established in a Regulation to be complied with by the infrastructure of the trans-European transport network. The trans-European transport network should be developed through the creation of new transport infrastructure, through the rehabilitation and upgrading of existing infrastructure and through measures promoting its resource-efficient use. In specific cases, due to the absence of regular maintenance in the past, rehabilitation of rail infrastructure is necessary. Rehabilitation is a process resulting in the achievement of the original construction parameters of existing railway infrastructure facilities combined with the long-term improvement of its quality compared to its current state, in line with the application of the requirements and provisions of this Regulation. In the implementation of projects of common interest, due consideration should be given to the particular circumstances of the individual project concerned. Where possible, synergies with other policies should be exploited, for instance with tourism aspects by including, within civil engineering structures such as bridges or tunnels, bicycle infrastructure for long-distance cycling paths like the EuroVelo routes. The trans-European transport network should best be developed through a dual-layer structure consisting of a comprehensive network and a core network based on a common and transparent methodology, those two layers being the highest level of infrastructure planning within the Union. The comprehensive network should be a Europe-wide transport network ensuring the accessibility and connectivity of all regions in the Union, including the remote, insular and outermost regions, as also pursued by the Integrated Maritime Policy established by Regulation (EU) No 1255/2011 of the European Parliament and of the Council (5), and strengthening social and economic cohesion between them. The guidelines laid down by this Regulation ("the guidelines") should set the requirements for the infrastructure of the comprehensive network, in order to promote the development of a high-quality network throughout the Union by 2050. 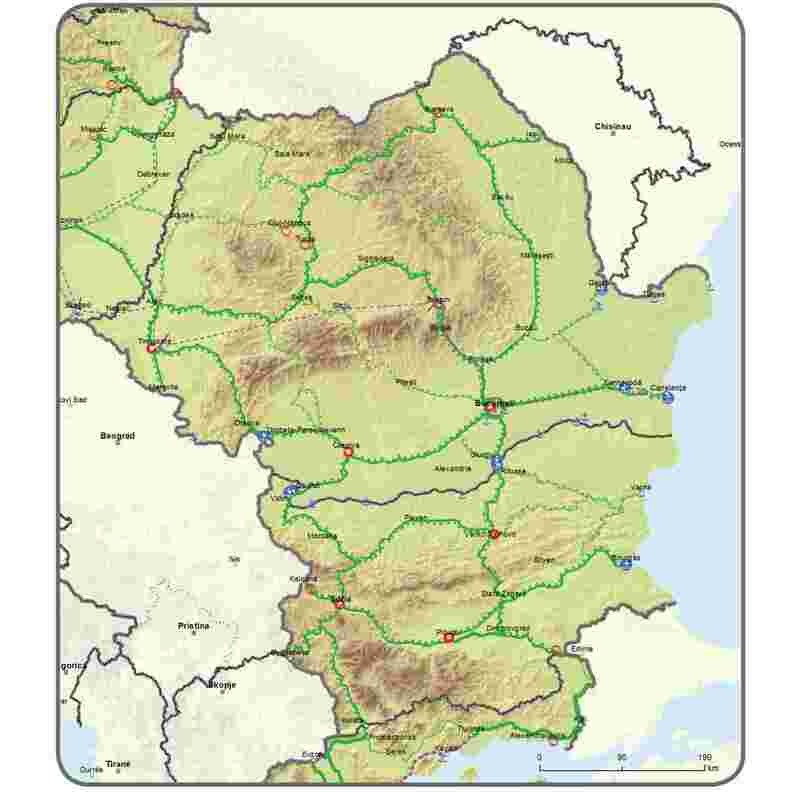 The White Paper also acknowledges that there remain substantial divergences, in terms of transport infrastructure, between Eastern and Western parts of the Union. Those divergences need to be tackled in order to achieve a fully integrated European transport infrastructure network. The core network should be identified and appropriate measures should be taken for its development by 2030 as a priority within the framework provided by the comprehensive network. The core network should constitute the backbone of the development of a sustainable multimodal transport network and should stimulate the development of the entire comprehensive network. It should enable Union action to concentrate on those components of the trans-European transport network with the highest European added value, in particular cross-border sections, missing links, multimodal connecting points and major bottlenecks serving the objective, set out in the White Paper, of reducing greenhouse gas emissions from transport by 60 % below 1990 levels by 2050. Exemptions from the infrastructure requirements applicable to the core network should be possible in duly justified cases. This should include cases where investment cannot be justified, for example in sparsely populated areas. The particular situation of isolated or partially isolated rail networks should be recognised by way of exemptions from certain infrastructure requirements. When carrying out the review of the implementation of the core network by 2023, the Commission should take into account national implementation plans and future enlargements. 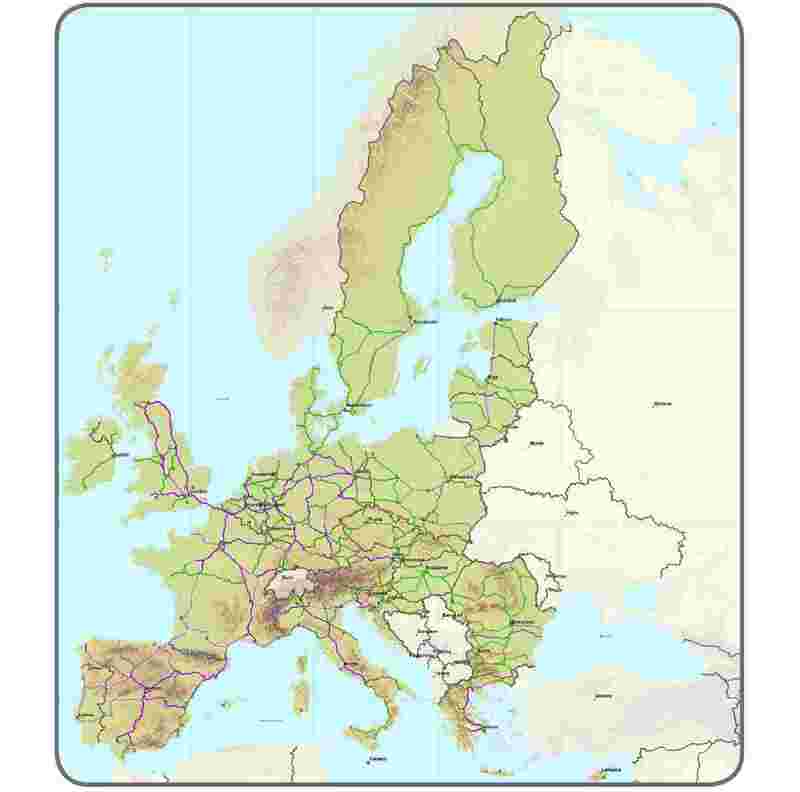 The trans-European transport network covers only part of the existing transport networks. 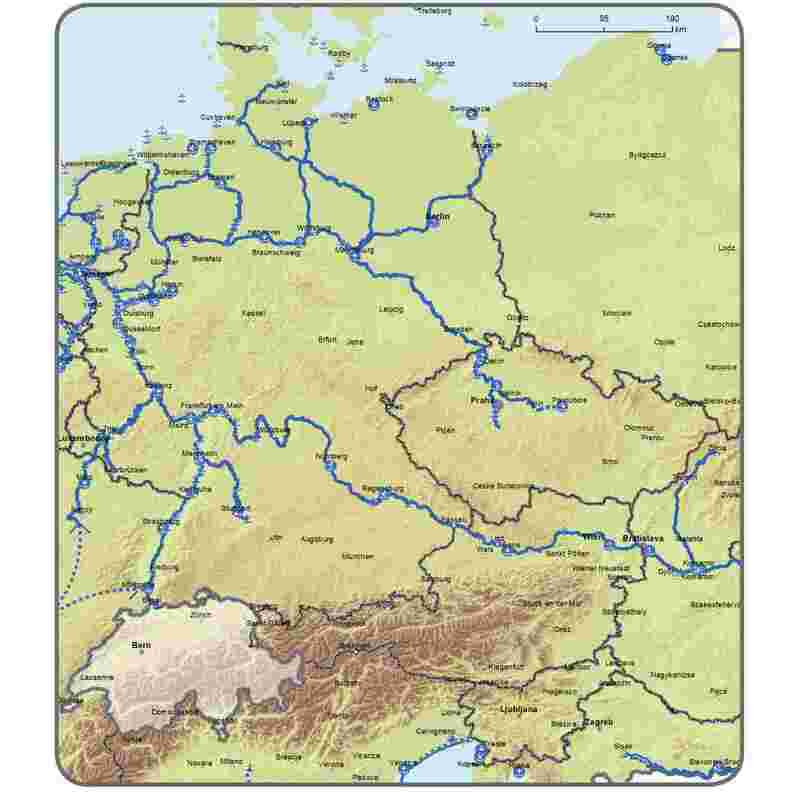 In the framework of the review of the implementation of the core network by 2023, the Commission should evaluate, in cooperation with the Member States concerned, whether other parts, such as certain class III inland waterways, should be integrated into the network. In the context of that review, the Commission should also assess the state of progress of the projects and should be able, where necessary, to reconsider the deadlines, taking account of any developments that may affect the likelihood of those deadlines being met. When carrying out the review of the implementation of the core network by 2023, the Commission, after consulting the Member States, should evaluate whether to include other parts in the network, especially the priority projects included in Decision No 661/2010/EU. In order to establish the core network in a coordinated and timely manner, thereby making it possible to maximise the network benefits, Member States concerned should ensure that appropriate measures are taken to finalise the projects of common interest by 2030. With respect to the comprehensive network, Member States should make all possible efforts with the aim of completing it and complying with the relevant provisions of the guidelines by 2050. It is necessary to identify projects of common interest which will contribute to the achievement of the trans-European transport network and which contribute to the achievement of the objectives and correspond to the priorities established in the guidelines. Their implementation should depend on their degree of maturity, on their compliance with Union and national legal procedures and on the availability of financial resources, without prejudging the financial commitment of a Member State or of the Union. Projects of common interest should demonstrate a European added value. Cross-border projects typically have a high European added value, but may have lower direct economic effects compared to purely national projects. Such cross-border projects should be the subject of priority intervention by the Union in order to ensure that they are implemented. Projects of common interest for which Union funding is sought should be the subject of a socio-economic cost-benefit analysis based on a recognised methodology, taking into account the relevant social, economic, climate-related and environmental benefits and costs. The analysis of climate-related and environmental costs and benefits should be based on the environmental impact assessment carried out pursuant to Directive 2011/92/EU of the European Parliament and of the Council (6). In order to contribute to the climate reduction targets of the Transport White Paper of a 60 % cut in greenhouse gas emissions below 1990 levels by 2050, the greenhouse gas impacts of projects of common interest in the form of new, extended or upgraded transport infrastructures should be assessed. Some parts of the network are managed by actors other than Member States. However, Member States are responsible for ensuring that the rules governing the network are correctly applied within their territory. As the development and implementation of the trans-European transport network requires a common application of this Regulation, all parts of the network should be subject to the rights and obligations provided for by this Regulation, as well as to those laid down in other relevant Union and national law. Cooperation with neighbouring and third countries is necessary in order to ensure connection and interoperability between the respective infrastructure networks. Therefore, the Union should where appropriate promote projects of common interest with those countries. In order to achieve modal integration across the network, adequate planning of the trans-European transport network is required. This also entails the implementation of specific requirements throughout the network in terms of infrastructure, telematic applications, equipment and services. It is therefore necessary to ensure adequate and concerted deployment of such requirements across Europe for each transport mode and for their interconnection across the trans-European transport network and beyond, in order to obtain the benefits of the network effect and to make efficient long-range trans-European transport operations possible. In order to determine existing and planned transport infrastructures for the comprehensive and the core network, maps should be provided and adapted over time to take into account the evolution of traffic flows. 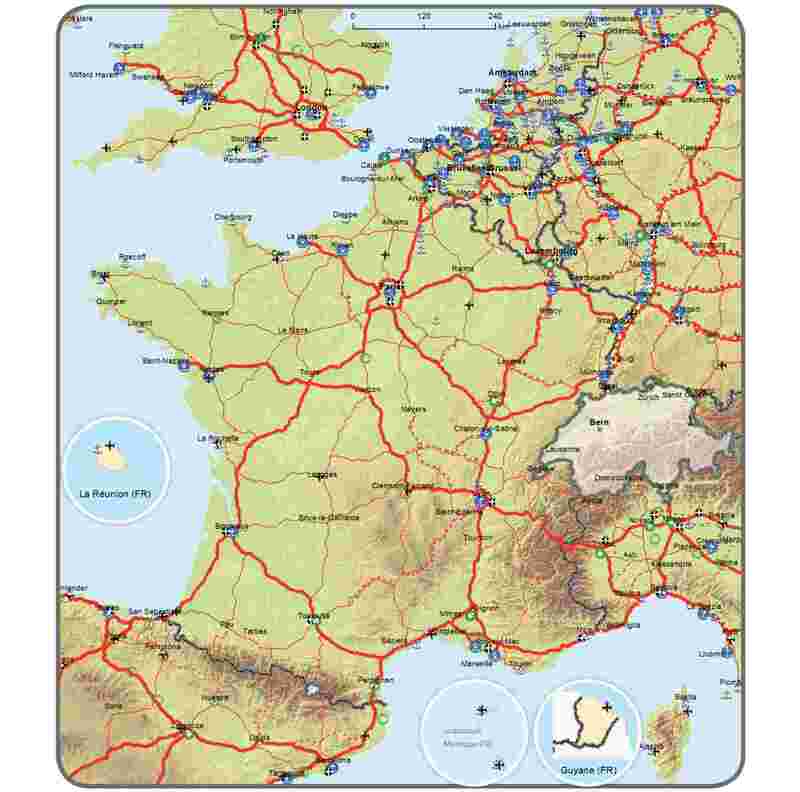 The technical basis of those maps is provided by the interactive geographical and technical information system for the trans-European transport network (TENtec), which contains a higher level of detail concerning the trans-European transport infrastructure. The guidelines should set priorities in order to enable the trans-European transport network to be developed within the specified timescale. Telematic applications are necessary in order to provide the basis for optimising traffic and transport operations and traffic safety and improving related services. Information to passengers, including information on ticketing and reservation systems, should be provided in line with Commission Regulation (EU) No 454/2011 (7). The guidelines should provide for the development of the comprehensive network in urban nodes, in accordance with Union aims regarding sustainable urban mobility, as those nodes are the starting point or the final destination ("last mile") for passengers and freight moving on the trans-European transport network and are points of transfer within or between different transport modes. Thanks to its large scale, the trans-European transport network should provide the basis for the large-scale deployment of new technologies and innovation, which, for example, can help to enhance the overall efficiency of the European transport sector and reduce its carbon footprint. This will contribute towards the objectives of the Europe 2020 Strategy and the White Paper's target of a 60 % cut in greenhouse gas emissions by 2050 (based on 1990 levels) and at the same time contribute to the objective of increasing fuel security for the Union. In order to achieve those objectives, the availability of alternative clean fuels should be improved throughout the trans-European transport network. The availability of alternative clean fuels should be based on demand for those fuels and there should not be any requirement to provide access to each alternative clean fuel at each fuel station. The trans-European transport network must ensure efficient multi-modality in order to allow better and more sustainable modal choices to be made for passengers and freight and in order to enable large volumes to be consolidated for transfers over long distances. This will make multimodality economically more attractive for passengers, users and freight forwarders. In order to achieve a high-quality and efficient transport infrastructure across all modes, the development of the trans-European transport network should take into account the security and safety of passengers and freight movements, the contribution to climate change and the impact of climate change and of potential natural and man-made disasters on infrastructure and accessibility for all transport users. During infrastructure planning, Member States and other project promoters should give due consideration to the risk assessments and adaptation measures adequately improving resilience to climate change and environmental disasters. Member States and other project promoters should carry out environmental assessments of plans and projects as provided for in Council Directive 92/43/EEC (8), Directive 2000/60/EC of the European Parliament and of the Council (9), Directive 2001/42/EC of the European Parliament and of the Council (10), Directive 2009/147/EC of the European Parliament and of the Council (11) and Directive 2011/92/EU in order to avoid or, where avoidance is not possible, to mitigate or compensate for negative impacts on the environment, such as landscape fragmentation, soil sealing and air and water pollution as well as noise, and to protect biodiversity effectively. The protection of the environment and of biodiversity, as well as the strategic requirements of inland waterway transport, should be taken into account. Member States and other project promoters should ensure that assessments of projects of common interest are carried out efficiently, avoiding unnecessary delays. Transport infrastructure should promote seamless mobility and accessibility for all users, in particular elderly people, persons of reduced mobility and disabled passengers. Member States should carry out ex-ante assessments of the accessibility of infrastructure and of the services connected to it. The core network should be a subset of the comprehensive network overlaying it. It should represent the strategically most important nodes and links of the trans-European transport network, according to traffic needs. It should be multimodal, that is to say, it should include all transport modes and their connections as well as relevant traffic and information management systems. The core network has been identified on the basis of an objective planning methodology. That methodology has identified the most important urban nodes, ports and airports, as well as border crossing points. Wherever possible, those nodes are connected with multimodal links as long as they are economically viable, environmentally sustainable and feasible until 2030. The methodology has ensured the interconnection of all Member States and the integration of the main islands into the core network. In order to implement the core network within the given timescale, a corridor approach could be used as an instrument to coordinate different projects on a transnational basis and to synchronise the development of the corridor, thereby maximising network benefits. That instrument should not be understood as a basis for the prioritisation of certain projects on the core network. Core network corridors should help to develop the infrastructure of the core network in such a way as to address bottlenecks, enhance cross-border connections and improve efficiency and sustainability. They should contribute to cohesion through improved territorial cooperation. Core network corridors should also address wider transport policy objectives and facilitate interoperability, modal integration and multimodal operations. This should allow specially developed corridors which are optimised in terms of emissions, thus minimising environmental impacts and increasing competitiveness, and which are also attractive on account of their reliability, limited congestion and low operating and administrative costs. The corridor approach should be transparent and clear and the management of such corridors should not create additional administrative burdens or costs. In agreement with the Member State concerned, the European Coordinators provided for in this Regulation should facilitate measures to design the right governance structure and to identify the sources of financing, both private and public, for complex cross-border projects for each core network corridor. European Coordinators should facilitate the coordinated implementation of the core network corridors. The role of the European Coordinators is of major importance for the development of, and cooperation along, the corridors. 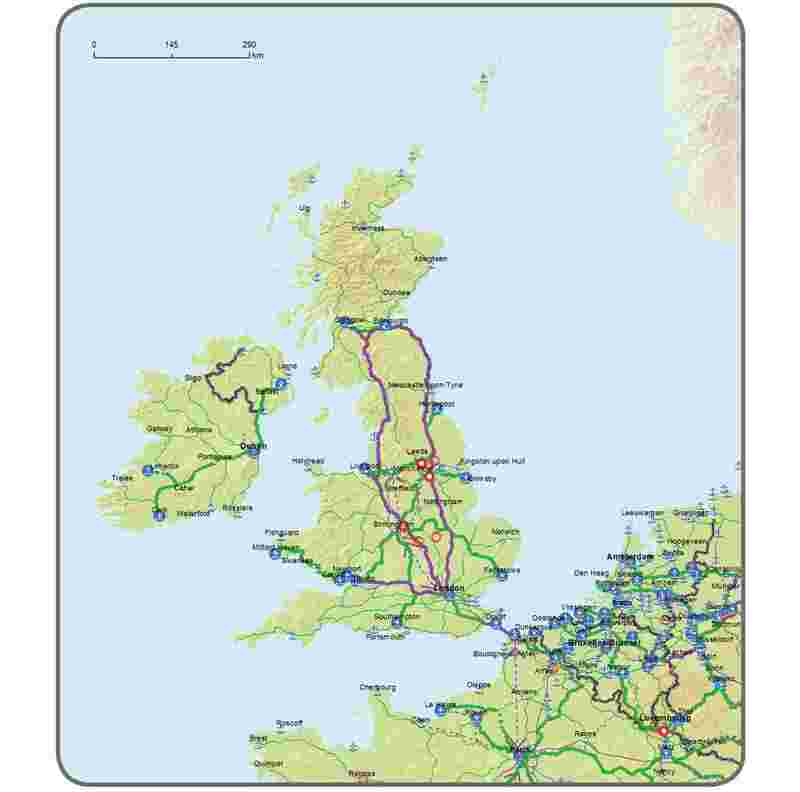 The core network corridors should be in line with the rail freight corridors set up in accordance with Regulation (EU) No 913/2010 of the European Parliament and of the Council (12) as well as the European Deployment Plan for the European Rail Traffic Management System (ERTMS) provided for in Commission Decision 2009/561/EC (13). In order to maximise consistency between the guidelines and the programming of the relevant financial instruments available at Union level, trans-European transport network funding should comply with this Regulation and be based, in particular, on Regulation (EU) No 1316/2013 of the European Parliament and of the Council (14). Correspondingly, it should aim at aligning and combining funding from relevant internal and external instruments such as structural and cohesion funds, the Neighbourhood Investment Facility (NIF) and the Instrument for Pre-Accession Assistance (IPA) (15), and from financing from the European Investment Bank, the European Bank for Reconstruction and Development and other financial institutions. In order to update the maps included in Annex I to take into account possible changes resulting from the actual usage of certain elements of transport infrastructure analysed against pre-established quantitative thresholds, the power to adopt acts in accordance with Article 290 of the Treaty on the Functioning of the European Union ("TFEU"), subject to Article 172 thereof, should be delegated to the Commission in respect of amendments to Annexes I and II. It is of particular importance that the Commission carry out appropriate consultations during its preparatory work, including at expert level. The Commission, when preparing and drawing up delegated acts, should ensure a simultaneous, timely and appropriate transmission of relevant documents to the European Parliament and to the Council. The interests of regional and local authorities, as well as those of local civil society affected by a project of common interest, should be appropriately taken into account in the planning and construction phase of projects. The European and national frameworks for transport infrastructure planning and implementation, as well as for the provision of transport services, offer opportunities for stakeholders to contribute to the achievement of the objectives of this Regulation. The new instrument for the implementation of the trans-European transport network, i.e. core network corridors, is a strong means of realising the respective potential of stakeholders, of promoting cooperation between them and of strengthening complementarity with actions by Member States. In order to ensure uniform conditions for the implementation of this Regulation, implementing powers should be conferred on the Commission. Those powers should be exercised in accordance with Regulation (EU) No 182/2011 of the European Parliament and of the Council (16). Since the objectives of this Regulation, in particular the coordinated establishment and development of the trans-European transport network, cannot be sufficiently achieved by the Member States and can therefore, by reason of the need for coordination of those objectives, be better achieved at Union level, the Union may adopt measures in accordance with the principle of subsidiarity as set out in Article 5 of the Treaty on European Union. In accordance with the principle of proportionality, as set out in that Article, this Regulation does not go beyond what is necessary in order to achieve those objectives. Decision No 661/2010/EU should be repealed. 1. This Regulation establishes guidelines for the development of a trans-European transport network comprising a dual-layer structure consisting of the comprehensive network and of the core network, the latter being established on the basis of the comprehensive network. 2. This Regulation identifies projects of common interest and specifies the requirements to be complied with for the management of the infrastructure of the trans-European transport network. 3. This Regulation sets out the priorities for the development of the trans-European transport network. 4. This Regulation provides for measures for the implementation of the trans-European transport network. The implementation of projects of common interest depends on their degree of maturity, the compliance with Union and national legal procedures, and the availability of financial resources, without prejudging the financial commitment of a Member State or of the Union. 1. This Regulation applies to the trans-European transport network as shown on the maps contained in Annex I. 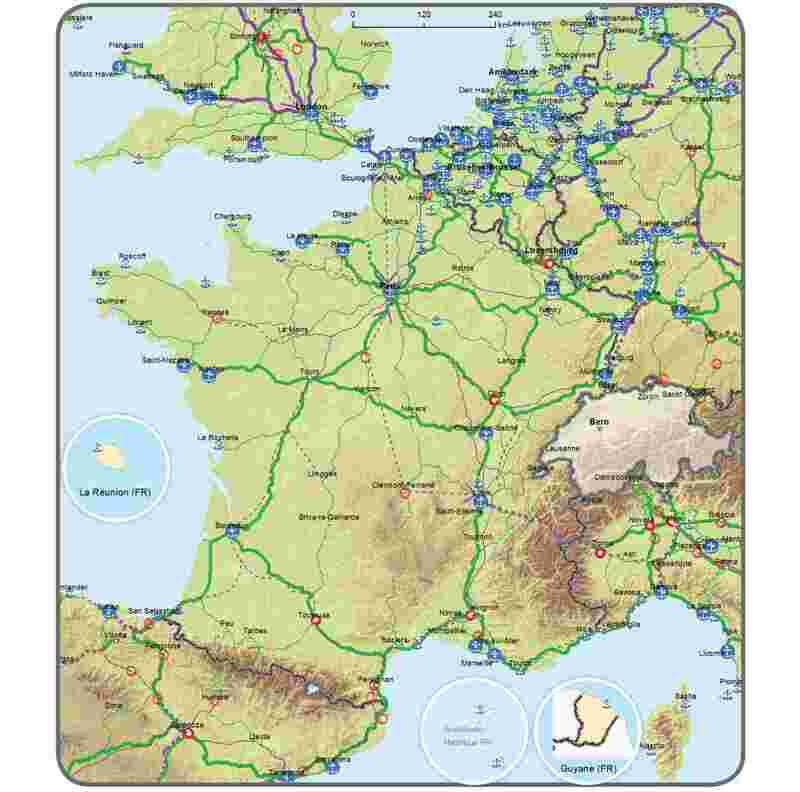 The trans-European transport network comprises transport infrastructure and telematic applications as well as measures promoting the efficient management and use of such infrastructure and permitting the establishment and operation of sustainable and efficient transport services. 2. 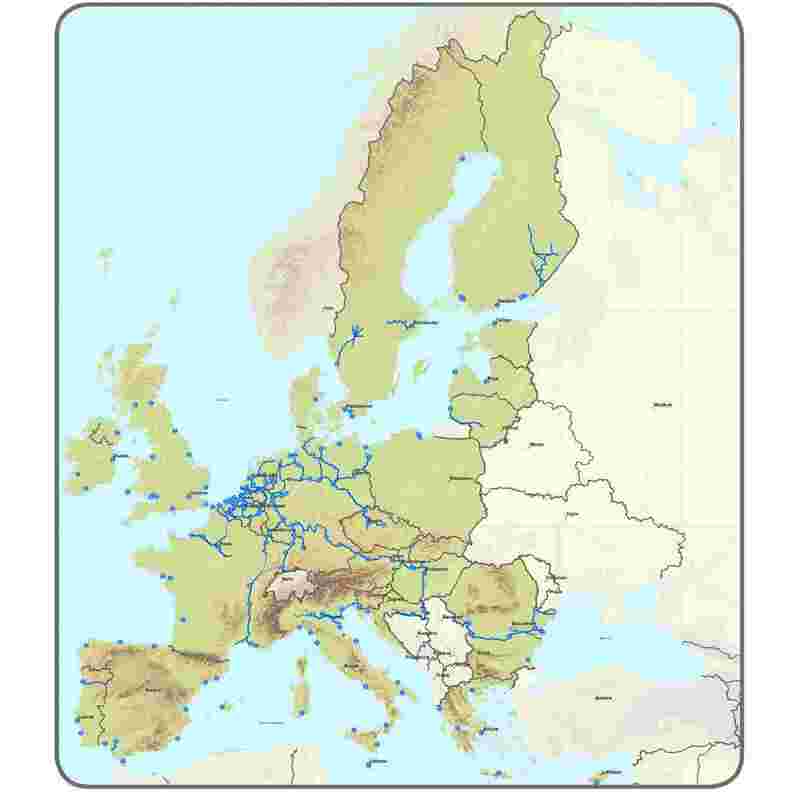 The infrastructure of the trans-European transport network consists of the infrastructure for railway transport, inland waterway transport, road transport, maritime transport, air transport and multimodal transport, as determined in the relevant sections of Chapter II. 'alternative clean fuels' means fuels such as electricity, hydrogen, biofuels (liquids), synthetic fuels, methane (natural gas (CNG and LNG) and biomethane) and liquefied petroleum gas (LPG) which serve, at least partly, as a substitute for fossil oil sources in the supply of energy to transport, contribute to its decarbonisation and enhance the environmental performance of the transport sector. accessibility for elderly people, persons of reduced mobility and disabled passengers. adequate consideration of the vulnerability of transport infrastructure with regard to a changing climate as well as natural or man-made disasters, with a view to addressing those challenges. 2. 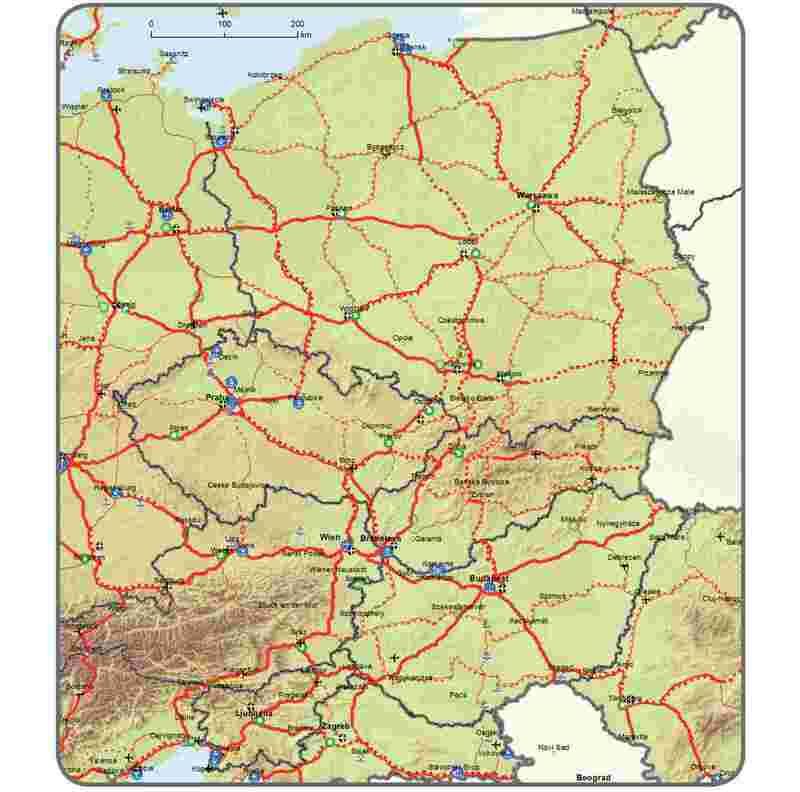 In planning and developing the trans-European transport network, Member States shall take account of the particular circumstances in the various parts of the Union, such as, in particular, tourism aspects and topographical features of the regions concerned. They may adapt the detailed route alignment of sections within the limits indicated in point (c) of Article 49(4) while ensuring compliance with the requirements set out therein. 1. The gradual development of the trans-European transport network shall be achieved, in particular, by implementing a dual-layer structure for that network with a coherent and transparent methodological approach, comprising a comprehensive network and a core network. 2. The comprehensive network shall consist of all existing and planned transport infrastructures of the trans-European transport network as well as measures promoting the efficient and socially and environmentally sustainable use of such infrastructure. It shall be identified and developed in accordance with Chapter II. 3. The core network shall consist of those parts of the comprehensive network which are of the highest strategic importance for achieving the objectives for the development of the trans-European transport network. It shall be identified and developed in accordance with Chapter III. 1. 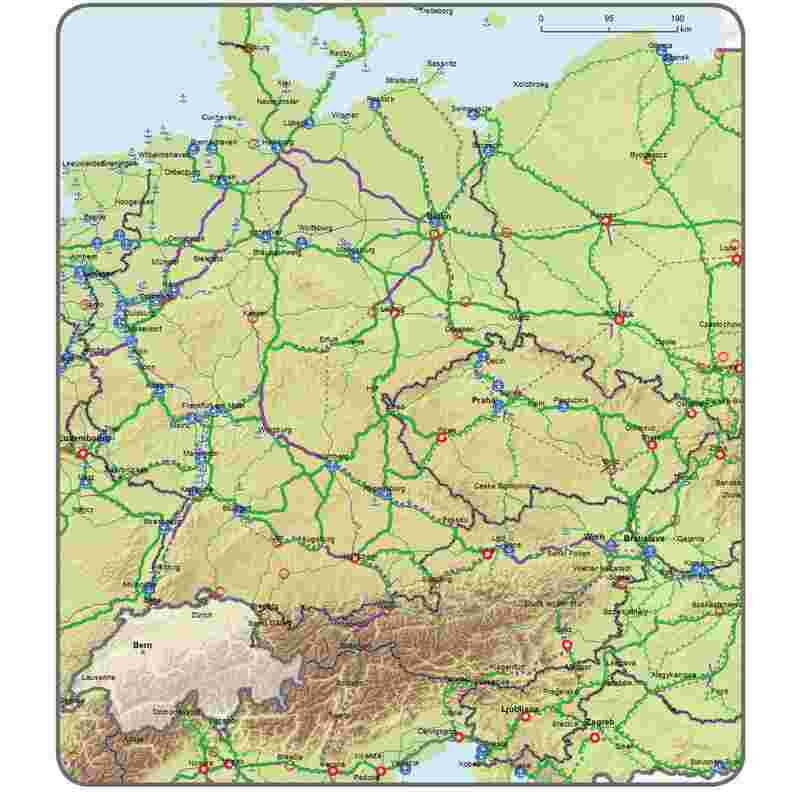 Projects of common interest shall contribute to the development of the trans-European transport network through the creation of new transport infrastructure, through the rehabilitation and upgrading of the existing transport infrastructure and through measures promoting the resource-efficient use of the network. 3. A project of common interest may encompass its entire cycle, including feasibility studies and permission procedures, implementation and evaluation. 4. Member States shall take all necessary measures to ensure that the projects are carried out in compliance with relevant Union and national law, in particular with Union legal acts on the environment, climate protection, safety, security, competition, state aid, public procurement, public health and accessibility. 5. 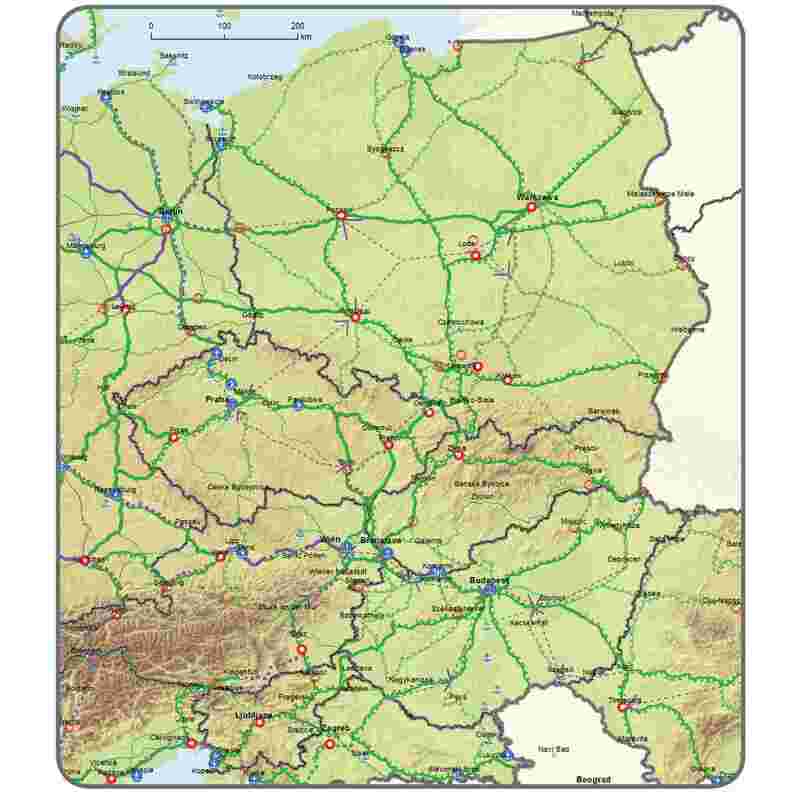 Projects of common interest are eligible for Union financial assistance under the instruments available for the trans-European transport network. 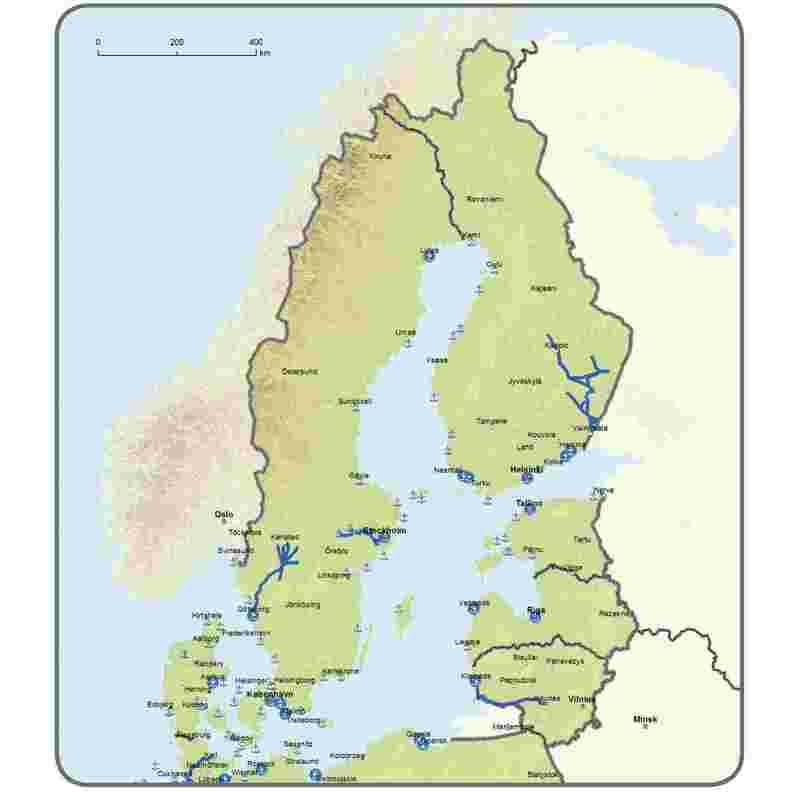 facilitate inland waterway transport with third countries. Such projects shall enhance the capacity or utility of the trans-European transport network in one or more Member States. facilitate maritime transport and promote motorways of the sea with third countries. 3. Projects under points (a) and (d) of paragraph 2 shall comply with the relevant provisions of Chapter II. 4. 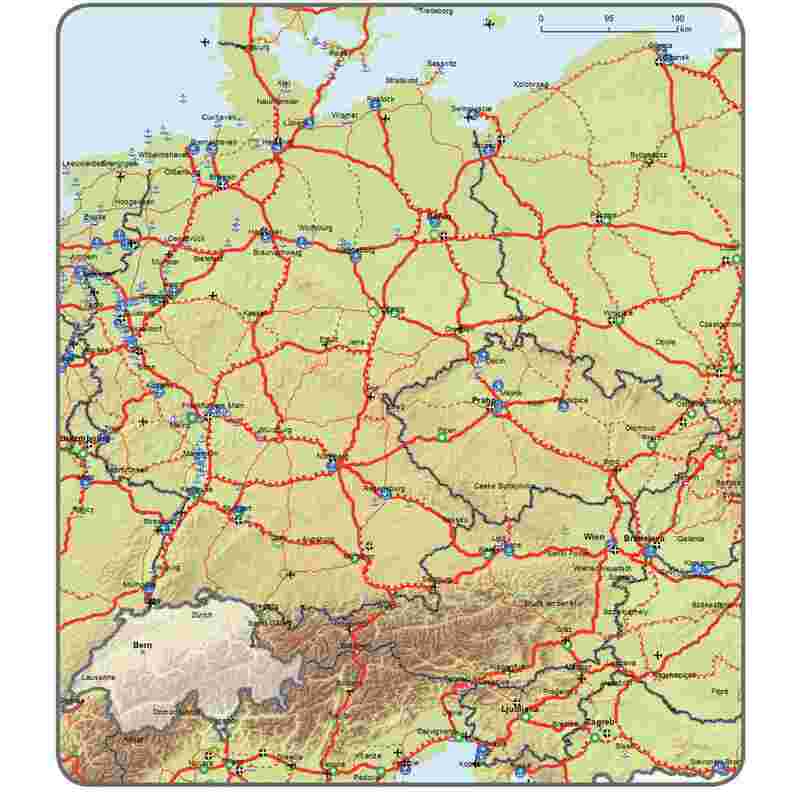 Annex III includes indicative maps of the trans-European transport network extended to specific neighbouring countries. 5. The Union may use existing, or set up and use new, coordination and financial instruments with neighbouring countries, such as the Neighbourhood Investment Facility (NIF) or the Instrument for Pre-Accession Assistance (IPA), for the promotion of projects of common interest. 6. The provisions of this Article are subject to the relevant procedures on international agreements as set out in Article 218 TFEU. take into account the physical limitations and topographical particularities of Member States' transport infrastructures, as identified in the technical specifications for interoperability (TSIs). 2. Member States shall make all possible efforts with the aim of completing the comprehensive network and of complying with the relevant provisions of this Chapter by 31 December 2050.
implementing and deploying telematic applications and promoting innovative technological development. removing administrative and technical barriers, in particular to the interoperability of the trans-European transport network and to competition. railway lines for conventional transport. 3. The technical equipment associated with railway lines may include electrification systems, equipment for the boarding and alighting of passengers and the loading and unloading of cargo in stations, logistic platforms and freight terminals. It may include any facility, such as automatic gauge-changing facilities for rail, necessary to ensure the safe, secure and efficient operation of vehicles, including their reduced impact on the environment and improved interoperability. 1. Freight terminals shall be connected with the road infrastructure or, where possible, the inland waterway infrastructure of the comprehensive network. complies with the requirements laid down in Directive 2012/34/EU of the European Parliament and of the Council (26), as regards acess to freight terminals. 3. At the request of a Member State, in duly justified cases, exemptions shall be granted by the Commission in respect of requirements that go beyond the requirements of Directive 2008/57/EC concerning ERTMS and electrification. where appropriate, connecting railway transport infrastructure with inland waterway port infrastructure. the connections of the inland ports to the other modes in the trans-European transport network. 2. To be part of the comprehensive network, inland ports shall have an annual freight transhipment volume exceeding 500 000 tonnes. The total annual freight transhipment volume shall be based on the latest available three-year average, as published by Eurostat. 3. Equipment associated with inland waterways may include equipment for the loading and unloading of cargos in inland ports. Associated equipment may include, in particular, propulsion and operating systems which reduce pollution, such as water and air pollution, energy consumption and carbon intensity. It may also include waste reception facilities, shore-side electricity facilities, and used oil collection facilities, as well as equipment for ice-breaking, hydrological services and dredging of the port and port approaches to ensure year-round navigability. 1. 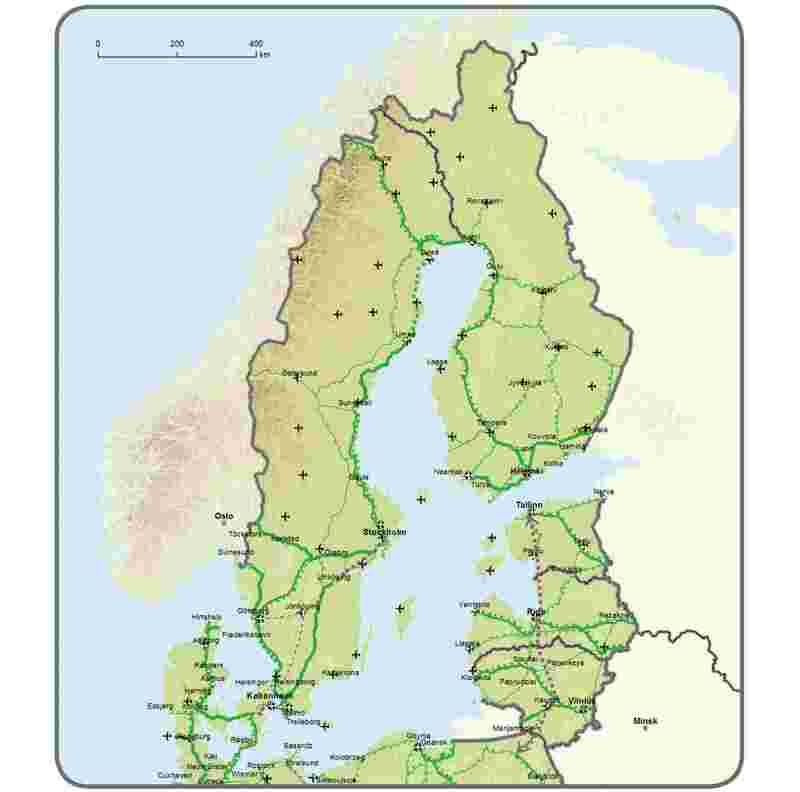 Member States shall ensure that inland ports are connected with the road or rail infrastructure. 2. Inland ports shall offer at least one freight terminal open to all operators in a non-discriminatory way and shall apply transparent charges. 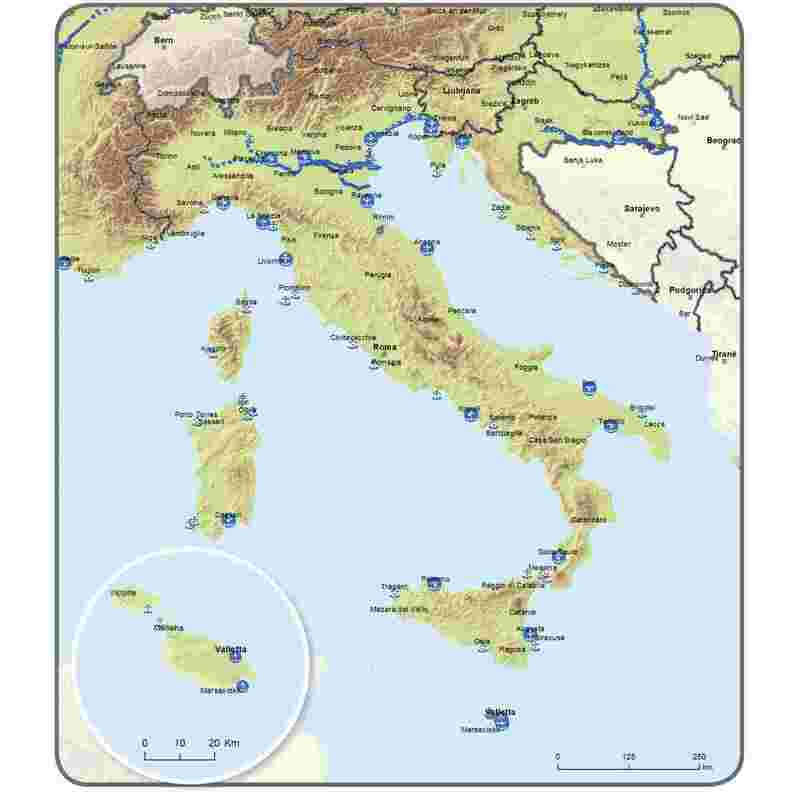 rivers, canals and lakes comply with the minimum requirements for class IV waterways as laid down in the new classification of inland waterways established by the European Conference of Ministers of Transport (ECMT) and that there is continuous bridge clearance, without prejudice to Articles 35 and 36 of this Regulation. rivers, canals and lakes are equipped with RIS. modernisation and expansion of the capacity of the infrastructure necessary for transport operations within the port area. 2. The high-quality roads referred to in point (a) of paragraph 1 are those which play an important role in long-distance freight and passenger traffic, integrate the main urban and economic centres, interconnect with other transport modes and link mountainous, remote, landlocked and peripheral NUTS 2 regions to central regions of the Union. Those roads shall be adequately maintained to allow safe and secure traffic. 3. High-quality roads shall be specially designed and built for motor traffic, and shall be either motorways, express roads or conventional strategic roads. is specially sign-posted as a motorway. does not cross at grade with any railway or tramway track. A conventional strategic road is a road which is not a motorway or express road but which is still a high-quality road as referred to in paragraphs 1 and 2. 4. Equipment associated with roads may include, in particular, equipment for traffic management, information and route guidance, for the levying of user charges, for safety, for reducing negative environmental effects, for refuelling or recharging of vehicles with alternative propulsion, and for secure parking areas for commercial vehicles. any intelligent transport system deployed by a public authority on road transport infrastructure complies with Directive 2010/40/EU and is deployed in a manner consistent with delegated acts adopted under that Directive. the mitigation of congestion on existing roads. telematic applications, including e-Maritime services and VTMIS. the maritime port is located in an outermost region or a peripheral area, outside a radius of 200 km from the nearest other port in the comprehensive network. 3. Equipment associated with maritime transport infrastructure may include, in particular, equipment for traffic and cargo management, for the reduction of negative effects, including negative environmental effects, and for the use of alternative fuels, as well as equipment to ensure year-round navigability, including ice-breaking, hydrological surveys, and for dredging, maintenance and protection of the port and port approaches. infrastructure for direct land and sea access. a maritime link and its hinterland connections between a core network port and ports of the comprehensive network, with a special focus on the hinterland connections of the core and comprehensive network ports. 3. Projects of common interest for motorways of the sea in the trans-European transport network may also include activities that have wider benefits and are not linked to specific ports, such as services and actions to support the mobility of persons and goods, activities for improving environmental performance, such as the provision of shore-side electricity that would help ships to reduce their emissions, making available facilities for ice-breaking, activities ensuring year-round navigability, dredging operations, and alternative fuelling facilities, as well as the optimisation of processes, procedures and the human element, ICT platforms and information systems, including traffic management and electronic reporting systems. 4. 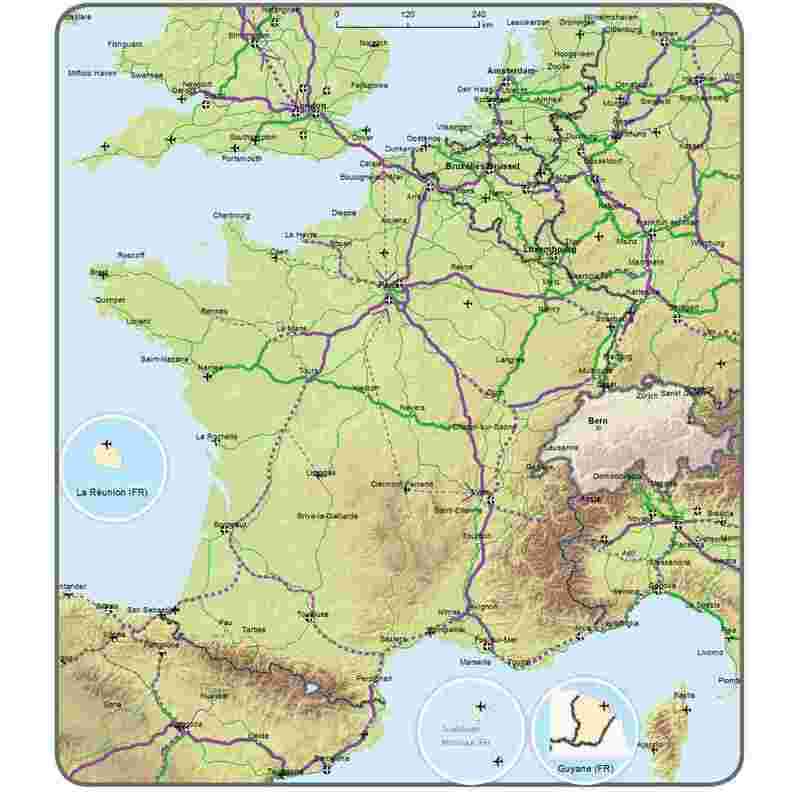 Within two years after being designated in accordance with Article 45, the European Coordinator for motorways of the sea shall present a detailed implementation plan for the motorways of the sea based on experiences and developments relating to Union maritime transport as well as the forecast traffic on the motorways of the sea. sea canals, port fairways and estuaries connect two seas, or provide access from the sea to maritime ports and correspond at least to inland waterway class VI. 2. Member States shall ensure that ports include equipment necessary to assist the environmental performance of ships in ports, in particular reception facilities for ship-generated waste and cargo residues in accordance with Directive 2000/59/EC of the European Parliament and of the Council (31) and in compliance with other relevant Union law. 3. Member States shall implement VTMIS and SafeSeaNet as provided for in Directive 2002/59/EC and shall deploy e-Maritime services, including in particular maritime single-window services, as provided for in Directive 2010/65/EU. air navigation systems, including the new-generation European air traffic management system (the "SESAR system"). for cargo airports, the total annual cargo volume is at least 0,2 % of the total annual cargo volume of all airports of the Union. The total annual passenger volume and the total annual cargo volume are based on the latest available three-year average, as published by Eurostat. 1. Member States shall ensure that any airport located on their territory offers at least one terminal which is open to all operators in a non-discriminatory way and which applies transparent, relevant and fair charges. 2. Member States shall ensure that common basic standards for safeguarding civil aviation against acts of unlawful interference, as adopted by the Union in accordance with Regulation (EC) No 300/2008 of the European Parliament and of the Council (32), apply to the air transport infrastructure of the comprehensive network. 3. Member States shall ensure that infrastructure for air traffic management is such as to permit the implementation of the Single European Sky in accordance with Regulation (EC) No 549/2004 of the European Parliament and of the Council (33), Regulation (EC) No 550/2004 of the European Parliament and of the Council (34), Regulation (EC) No 551/2004 of the European Parliament and of the Council (35) and Regulation (EC) No 552/2004, and of air transport operations, in order to improve the performance and sustainability of the European aviation system, of implementing rules and of Union specifications. improving sustainability and mitigating the environmental impact from aviation. where there is no freight terminal or logistic platform complying with point (a) in a NUTS 2 region, the terminal or platform in question is the main freight terminal or logistic platform designated by the Member State concerned, linked at least to roads and railways for that NUTS 2 region, or in the case of Member States with no rail system, linked only to roads. without prejudice to the applicable Union and national law, continuous passenger traffic across the comprehensive network is facilitated through appropriate equipment and the availability of telematic applications in railway stations, coach stations, airports and, where relevant, maritime and inland waterway ports. 2. Freight terminals shall be equipped with cranes, conveyors and other devices for moving freight between different transport modes and for the positioning and storage of freight. developing a smooth flow of information between the transport modes and enabling multimodal and single-mode services to be provided across the trans-European transport system. promotion of efficient low-noise and low-carbon urban freight delivery. 1. Telematic applications shall be such as to enable traffic management and the exchange of information within and between transport modes for multimodal transport operations and value-added transport-related services, improvements in safety, security and environmental performance, and simplified administrative procedures. Telematic applications shall facilitate seamless connection between the infrastructure of the comprehensive network and the infrastructure for regional and local transport. 2. Telematic applications shall be deployed where feasible across the Union, in order to enable a set of interoperable basic capabilities to exist in all Member States. for air transport: air traffic management systems, in particular those resulting from the SESAR system. improve links to the most vulnerable and isolated parts of the Union, in particular outermost, island, remote and mountain regions. further advance the development and deployment of telematic applications within and between modes of transport. Member States shall give due consideration to ensuring that transport infrastructure provides for safe and secure passenger and freight movements. During infrastructure planning, Member States shall give due consideration to improving resilience to climate change and to environmental disasters. Environmental assessment of plans and projects shall be carried out in accordance with the Union law on the environment, including Directives 92/43/EEC, 2000/60/EC, 2001/42/EC, 2009/147/EC and 2011/92/EU. Transport infrastructure shall allow seamless mobility and accessibility for all users, in particular elderly people, persons of reduced mobility and passengers with a disability. The design and construction of transport infrastructure shall comply with the relevant requirements laid down in Union law. 1. 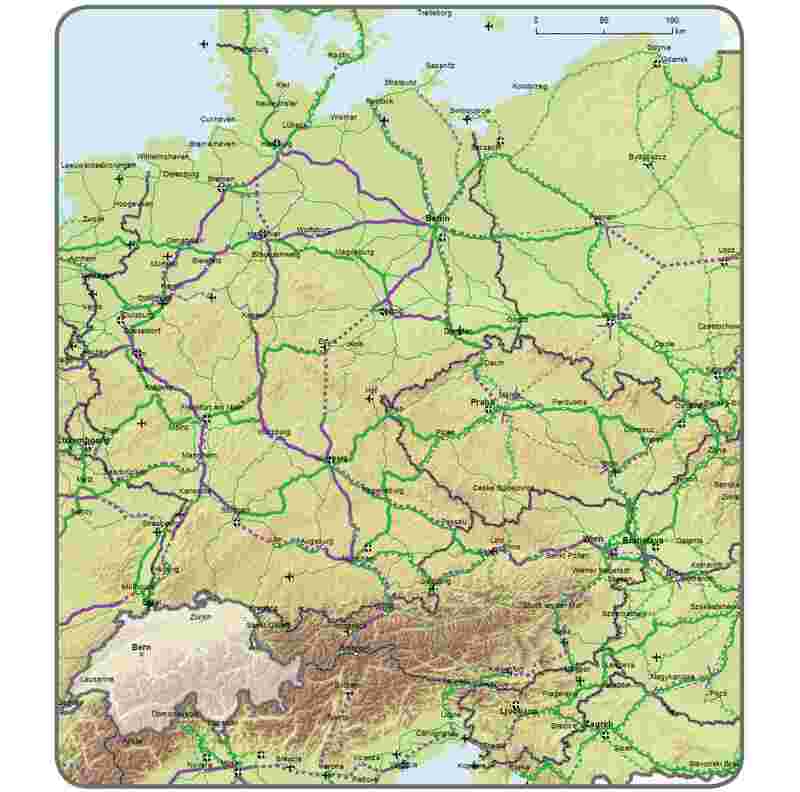 The core network, as shown on the maps contained in Annex I, shall consist of those parts of the comprehensive network which are of the highest strategic importance for achieving the objectives of the trans-European transport network policy, and shall reflect evolving traffic demand and the need for multimodal transport. It shall, in particular, contribute to coping with increasing mobility and ensuring a high safety standard as well as contributing to the development of a low-carbon transport system. 2. The core network shall be interconnected in nodes and provide for connections between Member States and with neighbouring countries' transport infrastructure networks. 3. Without prejudice to Article 1(4) and Article 41(2) and (3), Member States shall take the appropriate measures for the core network to be developed in order to comply with the provisions of this Chapter by 31 December 2030. In accordance with Article 54, the implementation of the core network shall be evaluated by the Commission by 31 December 2023. 1. Innovative technologies, telematic applications and regulatory and governance measures for managing the infrastructure use shall be taken into account in order to ensure resource-efficient use of transport infrastructure for both passengers and freight transport and to provide for sufficient capacity. nominal track gauge for new railway lines: 1 435 mm except in cases where the new line is an extension on a network the track gauge of which is different and detached from the main rail lines in the Union. capacity to make available alternative clean fuels. 3. Without prejudice to Directive 2008/57/EC, at the request of a Member State, as regards railway transport infrastructure, exemptions may be granted by the Commission in duly justified cases in relation to the train length, ERTMS, axle load, electrification and line speed. At the request of a Member State, as regards road transport infrastructure, exemptions from the provisions of points (a) or (b) of Article 17(3) may be granted by the Commission in duly justified cases as long as an appropriate level of safety is ensured. The duly justified cases referred to in this paragraph shall include cases where investment in infrastructure cannot be justified in socio-economic cost-benefit terms. The transport infrastructure included in the core network shall be developed in accordance with the corresponding provisions of Chapter II. 2. 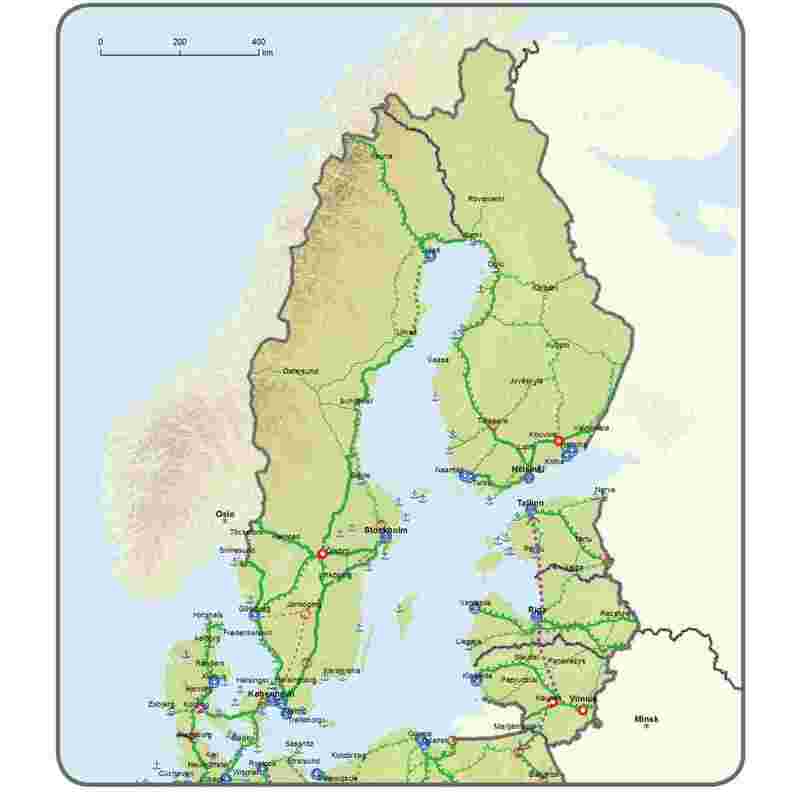 Maritime ports of the core network indicated in Part 2 of Annex II shall be connected with the railway and road and, where possible, inland waterway transport infrastructure of the trans-European transport network by 31 December 2030, except where physical constraints prevent such connection. 3. 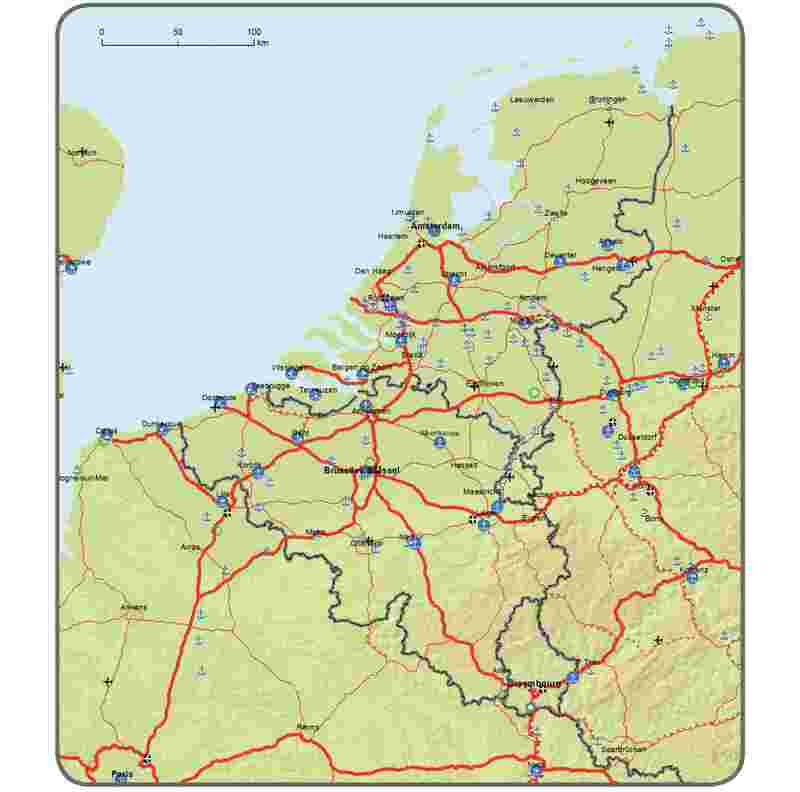 The main airports indicated in Part 2 of Annex II shall be connected with the railway and road transport infrastructure of the trans-European transport network by 31 December 2050, except where physical constraints prevent such connection. Taking into account potential traffic demand, such airports shall be integrated into the high-speed rail network wherever possible. a coordinated development of infrastructure, in particular in cross-border sections and bottlenecks. 2. Core network corridors shall enable Member States to achieve a coordinated and synchronised approach with regard to investment in infrastructure, so as to manage capacities in the most efficient way. The core network corridors shall support the comprehensive deployment of interoperable traffic management systems and, where appropriate, the use of innovation and new technologies. 1. Core network corridors cover the most important long-distance flows in the core network and are intended, in particular, to improve cross-border links within the Union. 2. Core network corridors shall be multimodal and open to the inclusion of all transport modes covered in this Regulation. They cross at least two borders and, if possible, involve at least three transport modes, including, where appropriate, motorways of the sea. 1. The list of core network corridors is set out in Part I of Annex I to Regulation (EU) No 1316/2013. Member States shall participate, as provided for in this Chapter, in those core network corridors. 2. The Commission shall make available schematic indicative maps of the core network corridors in a format easily accessible to the public. 1. In order to facilitate the coordinated implementation of core network corridors, ERTMS and motorways of the sea, the Commission shall, in agreement with the Member States concerned, and after consulting the European Parliament and the Council, designate one or more European Coordinators. 2. The European Coordinator shall be chosen, in particular, on the basis of his/her knowledge of issues relating to transport and to the financing and/or the socio-economic and environmental evaluation of major projects, as well as his/her experience of European institutions. 3. The Commission decision designating the European Coordinator shall specify how the tasks referred to in paragraph 5 are to be performed. 4. The European Coordinator shall act in the name and on behalf of the Commission, which shall provide the necessary secretarial assistance. The remit of the European Coordinator shall relate to a single core network corridor or to the implementation of ERTMS or to the implementation of motorways of the sea, respectively. examine the demand for transport services, the possibilities of investment funding and financing and the steps to be taken and the conditions to be met in order to facilitate access to such funding or financing, and give appropriate recommendations. 6. The European Coordinator may consult, together with the Member States concerned, regional and local authorities, transport operators, transport users and representatives of civil society in relation to the work plan and its implementation. 7. The Member States concerned shall cooperate with the European Coordinator and give the Coordinator the information required in order to perform the tasks prescribed in this Article, including information on the development of corridors in any relevant national infrastructure plans. 8. Without prejudice to the applicable Union and national law, the Commission may request the opinion of the European Coordinator when examining applications for Union funding for core network corridors with which the European Coordinator is entrusted, in order to ensure the consistency and advancement of each corridor. 9. If the European Coordinator is unable to carry out his or her mandate satisfactorily and in accordance with the requirements laid down in this Article, the Commission may at any time, in agreement with the Member States concerned, terminate that mandate. A replacement may be designated in accordance with the procedure set out in paragraph 1. 1. For each core network corridor, the relevant European Coordinator shall be assisted in the performance of his/her tasks concerning the work plan and its implementation by a secretariat and by a consultative forum (the Corridor Forum). In agreement with the Member States concerned, the Corridor Forum shall be established and chaired by the European Coordinator. The Member States concerned shall agree on the membership of the Corridor Forum for their part of the core network corridor. the coordinated development of infrastructure in cross-border sections. 1. 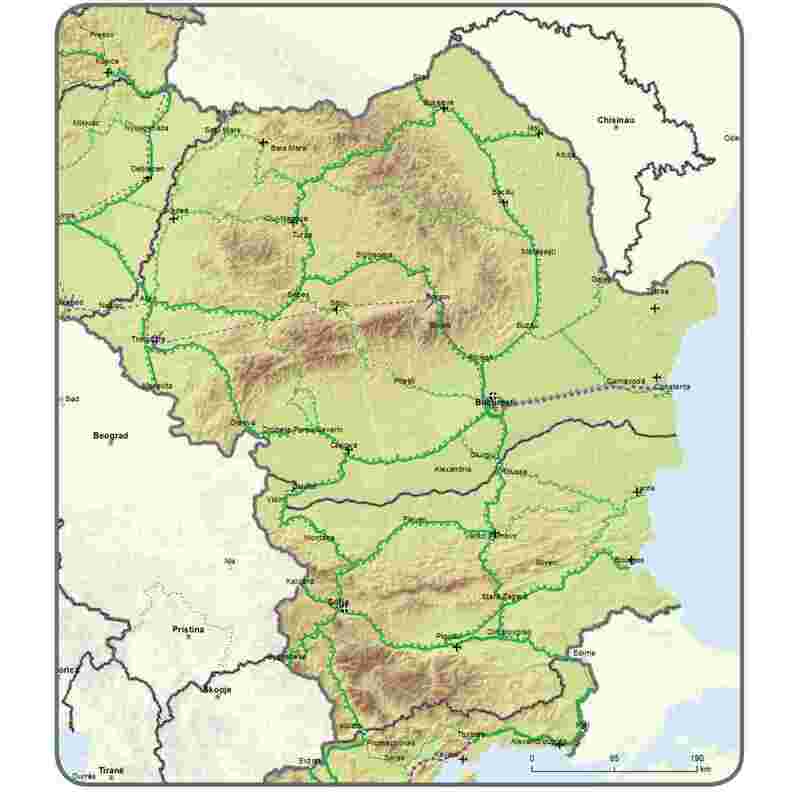 Each European Coordinator shall, by 22 December 2014, submit to the Member States concerned a work plan analysing the development of the corridor. After it has been approved by the Member States concerned, the work plan shall be submitted for information to the European Parliament, the Council and the Commission. measures to be taken in order to mitigate greenhouse gas emissions, noise and, as appropriate, other negative environmental impacts. The work plan shall include details of public consultations which support the development of the work plan and its implementation. the various sources envisaged, in partnership with the Member States concerned, for funding and financing, at international, national, regional, local and Union levels, including, whenever possible, earmarked cross-financing systems as well as private capital, together with the amount of commitments already made and, where applicable, reference to the contribution by the Union envisaged under the Union's financial programmes. 2. Subject to Article 1(4) and Article 54, and after approval by the Member States concerned, the Commission may adopt implementing acts for the cross-border and horizontal dimensions of the core network corridor work plans. Once adopted, the Commission shall adapt those implementing acts, after approval by the Member States concerned, to take into account the progress made, delays encountered or updated national programmes. Those implementing acts shall be adopted in accordance with the examination procedure referred to in Article 52(2). defining measures aimed at promoting the introduction of new technologies in traffic and capacity management and, where appropriate, reducing external costs, in particular greenhouse gas emissions and noise. 1. Adequate coordination shall be ensured between the core network corridors and the rail freight corridors provided for in Regulation (EU) No 913/2010, in order to avoid any duplication of activity, in particular when establishing the work plan or setting up working groups. 2. The provisions of this Chapter shall be without prejudice to the governance structures set out in Regulation (EU) No 913/2010. 1. Member States shall inform the Commission on a regular, comprehensive and transparent basis about the progress made in implementing projects and the investments made for that purpose. 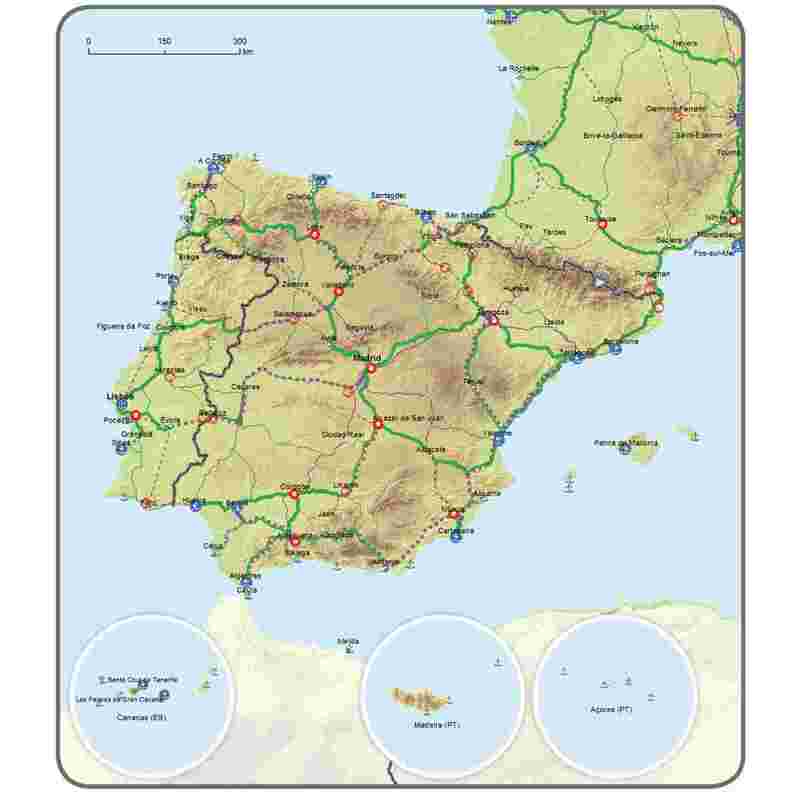 This shall include the transmission of annual data as far as possible through the interactive geographical and technical information system for the trans-European transport network (TENtec). It shall include all relevant data concerning projects of common interest in receipt of Union funding. The Commission shall ensure that TENtec is publicly and easily accessible and that it contains project-specific and updated information on the forms and amounts of Union co-funding, as well as on the progress of each project. The Commission shall ensure that TENtec does not make publicly available any information which is commercially confidential, or which could prejudice or unduly influence any process of public procurement in a Member State. The Commission shall make available information on financial assistance provided under other Union law, including the Cohesion Fund, the European Regional Development Fund and Horizon 2020, and in the form of loans and financing instruments established by the European Investment Bank. 2. Member States shall provide the Commission with abstracts of national plans and programmes which they are drawing up with a view to development of the trans-European transport network. Once they have been adopted, the Member States shall send the national plans and programmes to the Commission for information. 3. Every two years starting from 21 December 2013, the Commission shall publish a progress report on its implementation, which shall be submitted for information to the European Parliament, the Council, the European Economic and Social Committee and the Committee of the Regions. The report shall cover the use of the various forms of financial assistance mentioned in paragraph 1, for the various transport modes and other elements of the core and comprehensive networks in each Member State. The report shall also analyse the development of the trans-European transport network. It shall also outline the Commission's coordination of all forms of financial assistance with a view to supporting a coherent application of the guidelines in line with their objectives and priorities. 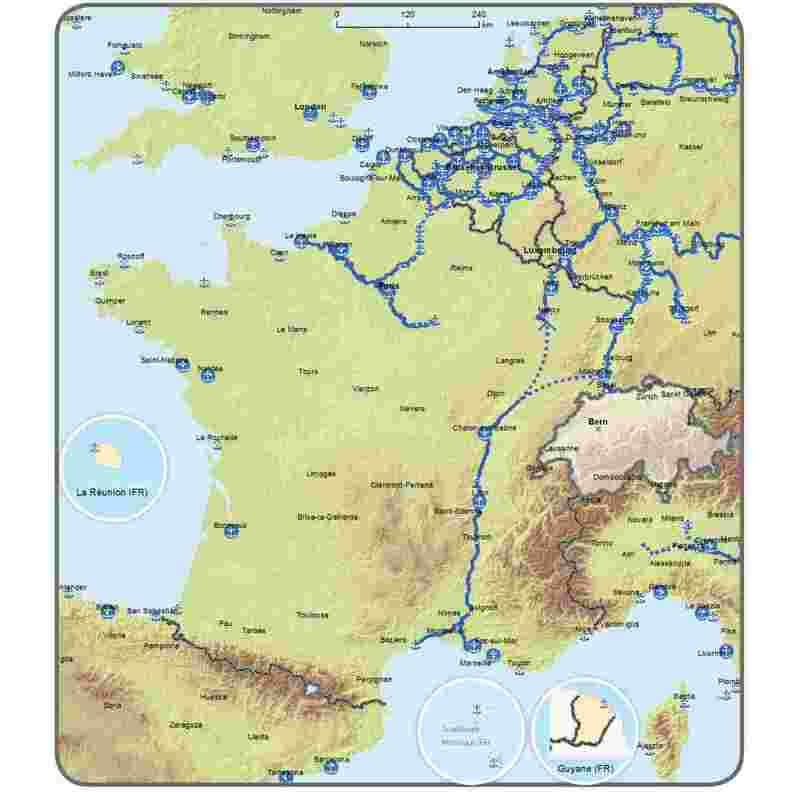 adjust the maps for road, railway and inland waterway infrastructure in a strictly limited way so as to reflect progress in completing the network. In adjusting those maps, the Commission shall not admit any adjustment in route alignment beyond that which is allowed by the relevant project authorisation procedure. The adaptations under points (a) and (b) shall be based on the latest available statistics published by Eurostat or, if those statistics are not available, by the national statistics offices of the Member States. The adaptations under point (c) shall be based on the information provided by the Member State concerned in accordance with paragraph 1. 5. 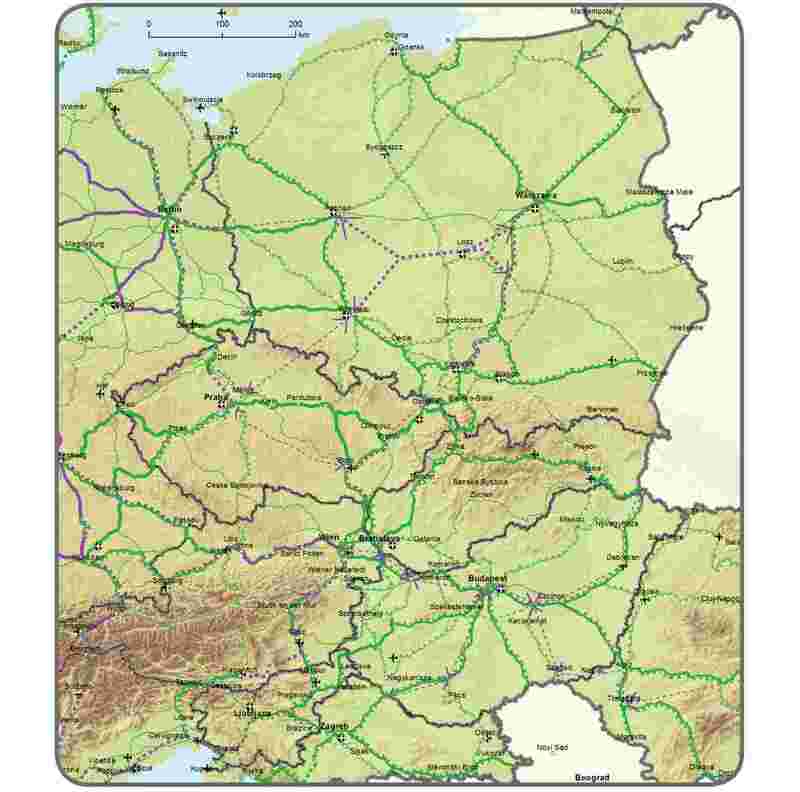 Projects of common interest concerning infrastructure which is newly included through a delegated act in the trans-European transport network shall be eligible for the purposes of Article 7(5) as from the date of entry into force of those delegated acts adopted pursuant to paragraph 4 of this Article. Projects of common interest concerning infrastructure which have been excluded from the trans-European transport network shall cease to be eligible as from the date of entry into force of the delegated acts adopted pursuant to paragraph 4 of this Article. The cessation of eligibility shall not affect financing or grant decisions taken by the Commission before that date. 6. Subject to Article 172(2) TFEU, the Commission shall be empowered to adopt delegated acts in accordance with Article 53 of this Regulation concerning the adaptation of Annex III in order to include or adapt indicative maps of neighbouring countries, based on high-level agreements on transport infrastructure networks between the Union and the neighbouring countries concerned. 1. Projects of common interest relate to all directly concerned stakeholders. These may be entities other than Member States, which may include regional and local authorities, managers and users of infrastructure as well as industry and civil society. 2. National procedures regarding regional and local authorities as well as civil society affected by a project of common interest shall be complied with, where appropriate, in the planning and construction phase of a project. The Commission shall promote the exchange of good practice in this regard. the enhancement of cooperation between the different stakeholders. Based on the objectives set out in Article 4, the Commission shall publish the underlying principles it uses for the assessment of socio-economic cost-benefit and European added value analyses in relation to projects of common interest for which Union funding is sought. 2. The power to adopt delegated acts referred to in Article 49(4) and (6) shall be conferred on the Commission for a period of five years from 21 December 2013. The Commission shall draw up a report in respect of the delegation of power not latter than nine months before the end of the five-year period. The delegation of power shall be tacitly extended for periods of an identical duration, unless the European Parliament or the Council opposes such extension not later than three months before the end of each period. 3. The delegation of powers referred to in Article 49(4) and (6) may be revoked at any time by the European Parliament or by the Council. A decision to revoke shall put an end to the delegation of the power specified in that decision. It shall take effect the day following the publication of the decision in the Official Journal of the European Union or at a later date specified therein. It shall not affect the validity of any delegated acts already in force. 5. A delegated act adopted pursuant to Article 49(4) and (6) shall enter into force only if no objection has been expressed either by the European Parliament or by the Council within a period of two months of the notification of that act to the European Parliament and the Council or if, before the expiry of that period, the European Parliament and the Council have both informed the Commission that they will not object. That period shall be extended by two months at the initiative of the European Parliament or of the Council. the need for amendments to this Regulation. The evaluation shall also consider, inter alia, the impact of evolving traffic patterns and relevant developments in infrastructure investment plans. In addition to carrying out that review, the Commission, in cooperation with the Member States, shall assess whether new sections, such as certain former cross-border priority projects listed in Decision No 661/2010/EU, are to be included in the core network. The Commission shall present a legislative proposal if appropriate. 2. When carrying out that review, the Commission shall evaluate whether the core network as provided for in this Regulation will comply with the provisions of Chapter III by 2030 while taking into account the economic and budgetary situation in the Union and in individual Member States. The Commission shall also evaluate, in consultation with the Member States, whether the core network should be modified to take into account developments in transport flows and national investment planning. If necessary, the Commission may submit a proposal for amendment of this Regulation. For that proposal, the Commission may also specify the date for completion of the comprehensive network as laid down in Article 9(2). Member States may appoint a Single Contact Authority for the purpose of facilitating and coordinating the process of granting permits for projects of common interest, in particular cross-border projects, in accordance with the applicable Union law. In the event of significant delay in starting or completing work on the core network, the Commission may ask the Member States concerned to provide the reasons for the delay. Such reasons shall be provided by the Member States within three months. On the basis of the reply given, the Commission shall consult the Member States concerned in order to resolve the problem that has caused the delay. The provisions relating to railways, and in particular any requirement to connect airports and ports to railways, shall not apply to Cyprus and Malta for as long as no railway system is established within their territory. 1. Financing decisions adopted under Regulation (EC) No 680/2007 of the European Parliament and of the Council (36), based on Decision No 661/2010/EU, which are under way at the time of entry into force of this Regulation shall continue to be subject to Decision No 661/2010/EU in the version in force on 20 December 2013. 2. References to priority projects as listed in Annex III to Decision No 661/2010/EU shall be construed as references to the core network as defined in this Regulation. Without prejudice to Article 58 of this Regulation and point (d) of Article 7(2) of Regulation (EU) No 1316/2013, Decision No 661/2010/EU is repealed. (1) OJ C 143, 22.5.2012, p. 130. (2) OJ C 225, 22.7.2012, p. 150. (3) Decision No 1692/96/EC of the European Parliament and of the Council of 23 July 1996 on Community guidelines for the development of the trans-European transport network (OJ L 228, 9.9.1996, p. 1). (4) Decision No 661/2010/EU of the European Parliament and of the Council of 7 July 2010 on Union guidelines for the development of the trans-European transport network (OJ L 204, 5.8.2010, p. 1). (5) Regulation (EU) No 1255/2011 of the European Parliament and of the Council of 30 November 2011 establishing a Programme to support the further development of an Integrated Maritime Policy (OJ L 321, 5.12.2011, p. 1). (6) Directive 2011/92/EU of the European Parliament and of the Council of 13 December 2011 on the assessment of the effects of certain public and private projects on the environment (OJ L 26, 28.1.2012, p. 1). (7) Commission Regulation (EU) No 454/2011 of 5 May 2011 on the technical specification for interoperability relating to the subsystem 'telematic applications for passenger services' of the trans-European rail system (OJ L 123, 12.5.2011, p. 11). (8) Council Directive 92/43/EEC of 21 May 1992 on the conservation of natural habitats and of wild fauna and flora (OJ L 206, 22.7.1992, p. 7). (9) Directive 2000/60/EC of the European Parliament and of the Council of 23 October 2000 establishing a framework for Community action in the field of water policy (OJ L 327, 22.12.2000, p. 1). (10) Directive 2001/42/EC of the European Parliament and of the Council of 27 June 2001 on the assessment of the effects of certain plans and programmes on the environment (OJ L 197, 21.7.2001, p. 30). (11) Directive 2009/147/EC of the European Parliament and of the Council of 30 November 2009 on the conservation of wild birds (OJ L 20, 26.1.2010, p. 7). (12) Regulation (EU) No 913/2010 of the European Parliament and of the Council of 22 September 2010 concerning a European rail network for competitive freight (OJ L 276, 20.10.2010, p. 22). (13) Commission Decision 2009/561/EC of 22 July 2009 amending Decision 2006/679/EC as regards the implementation of the technical specification for interoperability relating to the control-command and signalling subsystem of the trans-European conventional rail system (OJ L 194, 25.7.2009, p. 60). (14) Regulation (EU) No 1316/2013 of the European Parliament and of the Council of 11 December 2013 establishing the Connecting Europe Facility, amending Regulation (EU) No 913/2010 and repealing Regulations (EC) No 680/2007 and /EC No 67/2010 (See page 129 of this Official Journal). (15) Council Regulation (EC) No 1085/2006 of 17 July 2006 establishing an Instrument for Pre–Accession Assistance (IPA) (OJ L 210, 31.7.2006, p. 82). (16) Regulation (EU) No 182/2011 of the European Parliament and of the Council of 16 February 2011 laying down the rules and general principles concerning mechanisms for control by Member States of the Commission's exercise of implementing powers (OJ L 55, 28.2.2011, p. 13). (17) Directive 2010/40/EU of the European Parliament and of the Council of 7 July 2010 on the framework for the deployment of Intelligent Transport Systems in the field of road transport and for interfaces with other modes of transport (OJ L 207, 6.8.2010, p. 1). (18) Regulation (EC) No 552/2004 of the European Parliament and of the Council of 10 March 2004 on the interoperability of the European Air Traffic Management network (the interoperability Regulation) (OJ L 96, 31.3.2004, p. 26). (19) Council Regulation (EC) No 219/2007 of 27 February 2007 on the establishment of a Joint Undertaking to develop the new generation European air traffic management system (SESAR) (OJ L 64, 2.3.2007, p. 1). (20) Directive 2002/59/EC of the European Parliament and of the Council of 27 June 2002 establishing a Community vessel traffic monitoring and information system and repealing Council Directive 93/75/EEC (OJ L 208, 5.8.2002, p. 10). (21) Directive 2005/44/EC of the Parliament and of the Council of 7 September 2005 on harmonised river information services (RIS) on inland waterways in the Community (OJ L 255, 30.9.2005, p. 152). (22) Directive 2010/65/EU of the European Parliament and of the Council of 20 October 2010 on reporting formalities for ships arriving in and/or departing from ports of the Member States and repealing Directive 2002/6/EC (OJ L 283, 29.10.2010, p. 1). (23) Commission Decision 2006/679/EC of 28 March 2006 concerning the technical specification for interoperability relating to the control-command and signalling subsystem of the trans-European conventional rail system (OJ L 284, 16.10.2006, p. 1). (24) Commission Decision 2006/860/EC of 7 November 2006 concerning a technical specification for interoperability relating to the control-command and signalling subsystem of the trans-European high speed rail system and modifying Annex A to Decision 2006/679/EC concerning the technical specification for interoperability relating to the control-command and signalling subsystem of the trans-European conventional rail system (OJ L 342, 7.12.2006, p. 1). (25) Directive 2008/57/EC of the European Parliament and of the Council of 17 June 2008 on the interoperability of the rail system within the Community (OJ L 191, 18.7.2008, p. 1). (26) Directive 2012/34/EU of the European Parliament and of the Council of 21 November 2012 establishing a single European railway area (OJ L 343, 14.12.2012, p. 32). (27) Directive 2008/96/EC of the European Parliament and of the Council of 19 November 2008 on road infrastructure safety management (OJ L 319, 29.11.2008, p. 59). (28) Directive 2004/54/EC of the European Parliament and of the Council of 29 April 2004 on minimum safety requirements for tunnels in the trans-European road network (OJ L 167, 30.4.2004, p. 39). (29) Directive 2004/52/EC of the European Parliament and of the Council of 29 April 2004 on the interoperability of electronic road toll systems in the Community (OJ L 166, 30.4.2004, p. 124). (30) Commission Decision 2009/750/EC of 6 October 2009 on the definition of the European Electronic Toll Service and its technical elements (OJ L 268, 13.10.2009, p. 11). (31) Directive 2000/59/EC of the European Parliament and of the Council of 27 November 2000 on port reception facilities for ship-generated waste and cargo residues (OJ L 332, 28.12.2000, p. 81). (32) Regulation (EC) No 300/2008 of the European Parliament and of the Council of 11 March 2008 on common rules in the field of civil aviation security and repealing Regulation (EC) No 2320/2002 (OJ L 97, 9.4.2008, p. 72). (33) Regulation (EC) No 549/2004 of the European Parliament and of the Council of 10 March 2004 laying down the framework for the creation of the single European sky (the framework Regulation) (OJ L 96, 31.3.2004, p. 1). (34) Regulation (EC) No 550/2004 of the European Parliament and of the Council of 10 March 2004 on the provision of air navigation services in the single European sky (the service provision Regulation) (OJ L 96, 31.3.2004, p. 10). (35) Regulation (EC) No 551/2004 of the European Parliament and of the Council of 10 March 2004 on the organisation and use of the airspace in the single European sky (the airspace Regulation) (OJ L 96, 31.3.2004, p. 20). (36) Regulation (EC) No 680/2007 of the European Parliament and of the Council of 20 June 2007 laying down general rules for the granting of Community financial aid in the field of trans-European transport and energy networks (OJ L 162, 22.6.2007, p. 1).